The recent Hub of Africa fashion week in Addis Ababa, Ethiopia, attracted the cream of designers and clientèle from all over the world. The high-profile event, at the Millennium Hall, showcased the latest creations from 15 globally-renowned designers, putting the town of Chencha firmly on the African fashion map. The annual event, now in its sixth year, is having an uplifting effect on the economy – and the life of local residents – in this former sleepy hamlet. Worldwide interest in African fashions is providing employment for hundreds of local weavers, manufacturers and designers, whose fabrics and designs are reaching catwalks as far afield as Tokyo and New York. Chencha is home to the Dorze community, whose weaving specialists have enjoyed an upsurge in employment, thanks to international interest in their beautiful, colourful, African fabrics. One local weaver, Tsehynesh Tara, said she felt “giddy” after seeing her fabrics adorning supermodels on the world’s catwalks. She is one of many weavers employed by 27-year-old fashion designer Mahlet Afework, who’s based in Addis Ababa and employs female weavers from rural areas of Ethiopia. Mahlet, a former model and rap artist, who then moved to fashion design, has collaborated with UK designer Markus Lupfer, hosting exhibitions at London College of Fashion. She says Ethiopian fashion is helping lift local women out of poverty, estimating an average of 500 weavers in each village are steadily finding employment as world interest in African fashion grows. For weaver Tsehynesh, this has meant earning a sustainable income, which is supporting her family. She is thrilled to be able to help her family and also to be working for a renowned fashion house. 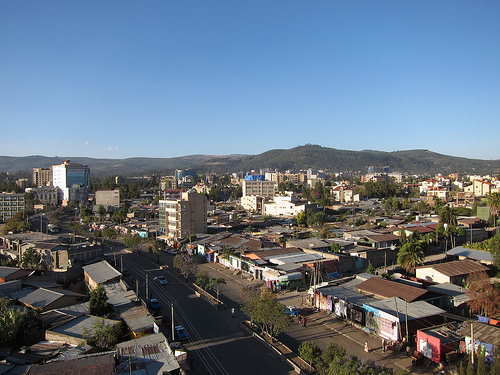 Chencha is home to Shiromeda, Ethiopia’s largest clothing market, where it has traditionally been a male-dominated employment sector. But the need for more skilled weavers has led to an increasing number of women finding work and an improvement in wages, especially since Mahlet makes a point of employing them directly, ensuring they receive a decent salary. Initially, she became aware of Chencha’s weavers through a United Nations’ event to encourage Ethiopian women to find work. Now, organisations such as Addis Ababa’s Centre for African Women’s Economic Empowerment enable weavers to meet designers directly. The secretary-general of the United Nations, Ban Ki-Moon, visited the CAWEE in person in July this year to publicly show his support for the employment of rural weavers in the Ethiopian fashion industry.